Every year, young children around the world await the arrival of Santa Claus on Christmas Eve. In the same house are parents who wonder if this is the year their child begins to question the magical nature of Santa Claus. With delicious confections and marvelous toys. Father Christmas, St. Nicholas, Santa himself. There’s an actual person who’s rarely the same. The main character in our story is Kristin, who is a very inquisitive girl. Helpful Kristin spreads frosting on cupcakes with care. All she can about Santa before his return. “Can you tell me why he dresses only in red? Does he know to watch out for the planes overhead? Will he eat all the cookies we put on his plate? Does he care for his health? Is he watching his weight? “Do his reindeer get tired? Do they ever get rest? Should we feed them some apples? Are carrots the best? Kristin’s parents realize that their daughter is growing up and is questioning many of her own beliefs about Santa Claus and Christmas. To see bright decorations and wreaths on the doors. While the courthouse and theater glisten and glow. They arrive at a church and Nativity scene. To the babe in the manger with the glowing halo. Offer frankincense, gold, and sweet myrrh in a jar. And an angel who heralds the birth of the Light. When the family returns home, Kristin’s parents decide that the time is right. They bring her into their bedroom, where she sits on the edge of their bed. An engraved wooden box that he made by himself. What is in the Santa Box? You will just have to read the entire poem yourself. Suffice it to say, with a simple method and a faith-filled message, Kristin’s parents succeed in empowering their daughter with the love and giving spirit of that first Christmas. Place your hand on your heart and describe what you feel. Is a love that’s more precious than silver and gold. 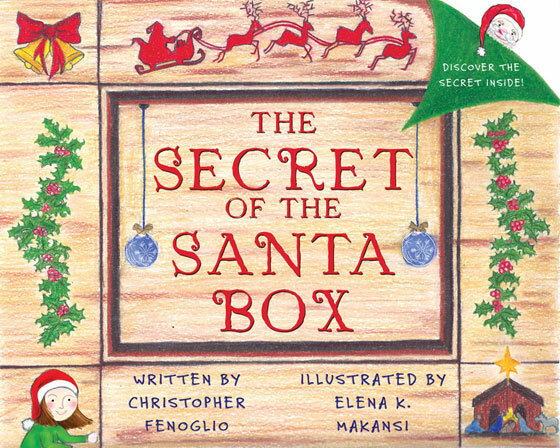 Order your copy of THE SECRET OF THE SANTA BOX today!